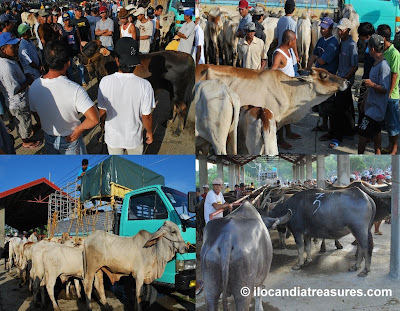 On our trip to Vigan last month, we dropped by to see the marketplace for livestock called Dayo in the town of Badoc, Ilocos Norte. It is located just at the foot of the Badoc Bridge. It is formerly located at Barangay Napu. This is my second time to see this, now on its new location. Dayo means to import the two kinds of livestock; the cattle or baka and the carabao or nuang. They still come from other towns in Ilocos Norte as well as in the province of Ilocos Sur. This is basically a trading ground where farmers have to visit this place so that they could buy cows or carabaos they will use in the fields or could sell their own here. This trade business traces its roots from the barter system where one could swap his own livestock to other people. The place was jampacked with men who were busy negotiating with each other. The livestock were lined up at both sides. I was surprised to learn the rates of these animals when I asked some of the people there. It was also big sum of money when the livestock are sold. The cow at two years of age is sold at Php25, 000.00 whereas a carabao is a little bit expensive at around Php28, 000.00 or higher. Before or after the business transaction, they would take a heavy breakfast here. 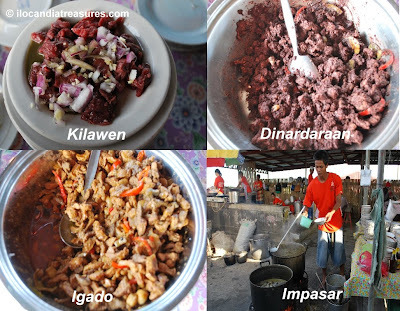 Stalls sell a variety of meat viands ranging from adobo (meat cooked in soy sauce), dinardaraan (meat cooked with blood), kilawen (fresh meat of cow seasoned with lemon and spices), igado (composed of internal organs), tinuno (grilled pork meat), and impasar (beef stew or soup). We had a dose of rich cholesterol where we ordered impasar and tinuto with rice. Dayo is usually held at this place every Wednesdays while the other one happens every Sunday at Batac, Ilocos Norte. Happy trading and eating!